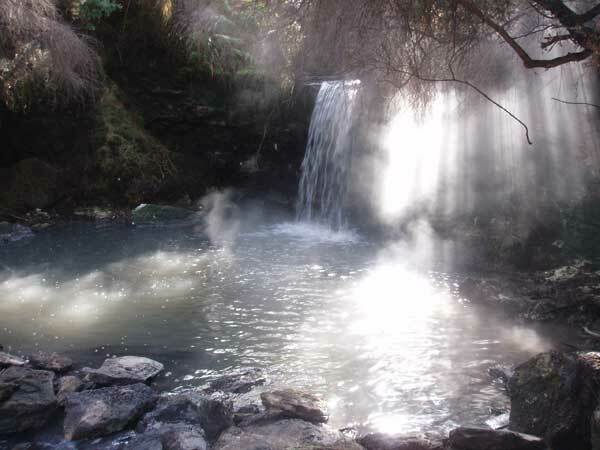 Map showing location of Waterfall Spout Bath, Waiotapu . Use the controls on the map to zoom in and out. Its definitely pretty and easy to find, but there is a huge government warning sign next to the pool because of Meningitis amebas, which by the way at 100% fatal if contracted. The sign advises to keep the water out of your noise, but is it really worth the risk? Also the entire trail leading up to pool is covered in used toilet paper. Ew. Great spot. Easy to find as described in previous review. Not too hot even on a sunny summer day. Good suitable for naked bathing. Other than st secret place there were nobody there. To get to the waterfall you drive to the barrier arm at the beginning of the road that leads you down to the Lady Knox Geyser at Wai-O-Tapu (Note, the barrier arm is closed after the geyser has finished in the morning approx 11am, so you cannot drive your car down). Park somewhere near the barrier arm (but not in front of it!) and walk for 5 minutes down the road until you are almost at the entrance gate to the geyser. You will see a track just after you pass the stream that goes underneath the road. 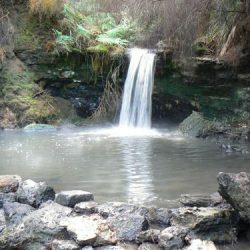 The waterfall is just 1 minute walk from the road. If there are no cars when you parked up at the barrier arm will mean you will be the only one there so swimsuits are optional. My advice is take a pair of Crocs or flip-flops because the mud/sand on the bottom can be very hot in places - almost too hot to stand, particularly directly under the waterfall (so I found out!). 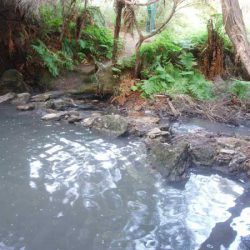 The water is only a few feet deep and has a grey thermal mud bottom, so if you are expecting crystal clear water to bathe forget it here - it's rustic and natural as it gets. Also note the Lady Knox geyser is under camera surveillance, so don't even think about trying to get a free look at that after your swim or security will be after you like a shot. Although can be difficult to find it certainly alot quieter than any of the other pools in the area. I visited several times and no one ever there so it's a great nudist pool. 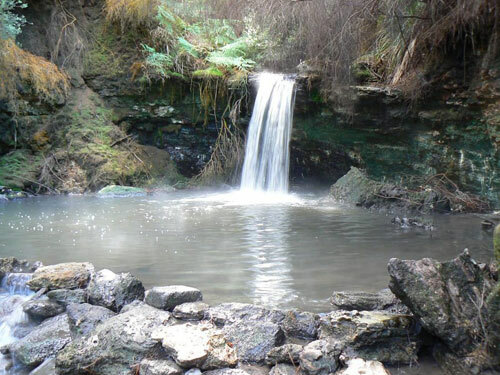 Water temperature varies with rainfall but overall great to have a massage by the waterfall! full of mud, leaves etc shallow and dirty. diffivult to find track over grown-large sign about menigitis infected. 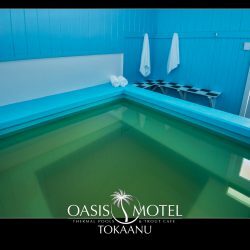 Go to the other place or waikite valley thermal springs. Locked road at night. You're probably better off driving up to the Lady Knox Geyser parking area, and turning round there, it's only 200-300 metres back from the car park. Still the best spot in the area. 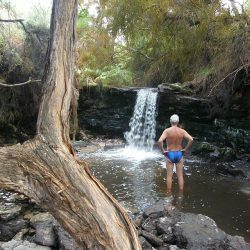 This is a lovely pool, the waterfall gives you a vigorous massage, the water stings your eyes though, can be VERY hot underfoot (or bottom! ), there are lots of leaves etc in the pool too, but that's what you get in a pool surrounded by bush, it is great! Perfect spot. Hot, lovely standing under the waterfall, and had the place to ourselves. The track is rather overgrown though (but isn't that part of the fun?!). After reading about litter at other pools in the area, perhaps it's a good job that the gate on the road is shut at 5pm every evening. A bit of a scramble but private and quite nice if the pool at the bridge is full. I love hot springs I have been to dozens all over Western Canada and none have compared to this. Its a short jaunt from the road that I found relatively easy to get to, you come in and the water is quite warm but the bottom can be scalding especially since it's so hard to wear jandels in the water, I gave it a 6 because while it is a crazy experience to stand under a hot spring waterfall it's kinda hard to do so since you burn the hell out of your feet and can't really float over either since it's rather shallow and then you burn your bum! You have to see and experience it though nothing cooler that a natural hot shower! 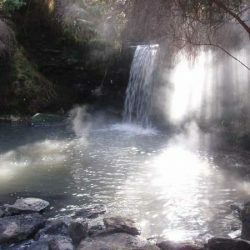 The track to this hotpool can be seen on the right about 500m up the road to the Lady Knox Geyser, with a tree partly fallen over the track a few metres from the road. There are some hot spots in the pool so be careful where you stand. Not the ideal spot really, you have to clamber through the undergrowth to get to it and you get the feeling that it is rather discouraged. 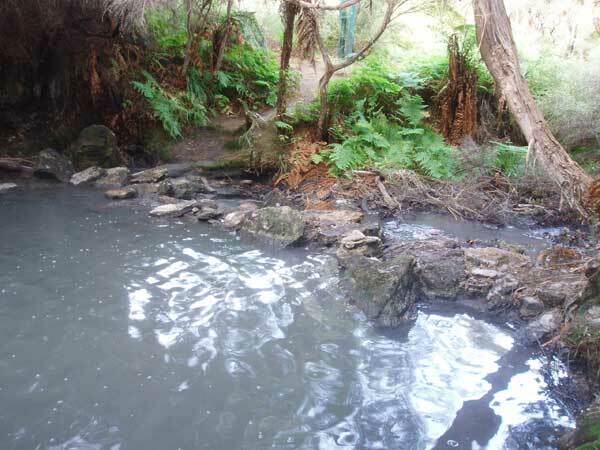 Glad I visited it though - the other side of Rotorua as it were, in it's raw form. Beautiful but spooky.